God has always made a way for mankind. It's His nature. But many times we think we have to make the way ourselves. It's not until we realize that we don't know what to do that we are able to hear God's voice. God Will Make a Way is an approach to specific problems in the Christian's life, but more than that, it's a new approach to solving life itself. Drs. Cloud and Townsend introduce ten "life principles" and then demonstrate how eighteen real-world dilemmas are solved by their application. The book concludes with a plan to encourage each reader to develop a personal strategy for using these principles to bring about life-changing healing. About "God Will Make a Way"
Dr. Cloud is a clinical psychologist with a unique ability to connect with his audiences. Drawing upon his broad range of experiences in private practice, leadership consulting, and media, he simplifies life's issues and gives easy-to-understand, practical advice. It is Dr. Cloud's humour, compassion, and 'in the moment' confrontation that make his approach to psychology and spirituality such a success. He has written or co-written 19 books, including the best-selling Boundaries. His most recent books are Integrity, Necessary Endings and The Law of Happiness. He has earned three Gold Medallion awards and was awarded the distinguished Retailers Choice award for God Will Make A Way. Dr. Cloud has appeared on numerous radio and television broadcasts and has been featured in many publications. Millions of listeners have benefited from his wit and wisdom for over a decade. As president of Cloud-Townsend Resources, he has produced and conducted hundreds of public seminars around the country. He speaks on relationships - marriage, parenting, dating, personal growth, and spirituality. His seminars are often broadcast live to over two thousand venues at a time. In his consulting practice, he works with leaders of organisations and corporations, from family-held firms to Fortune 25 companies and non-profit organisations. With his extensive executive coaching background and experience as an organisational and leadership consultant, he speaks regularly at corporate and leadership events held across the United States and internationally. Dr. Cloud co-founded a health-care company that operated treatment centres in 35 cities in the Western United States; he served as Clinical Co-Director for ten years. In that context of hands-on clinical experience, he researched and developed many of the treatment methods and principles he communicates to audiences today. Since then, he has devoted his time to spreading principles of hope and life change through speaking, writing, and the media. His books have sold over four million copies. He is a graduate of Southern Methodist University, having earned a BS in psychology with honours. He completed his PhD in clinical psychology at Biola University and his clinical internship at Los Angeles County Department of Mental Health. His philanthropic interests lie in the area of homelessness and the inner city, as well as Third World missions and development. He serves on the board of the Los Angeles Mission, a rescue mission on Skid Row in downtown Los Angeles. 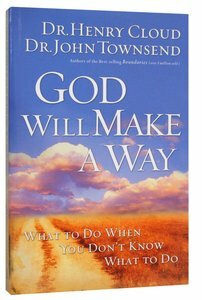 Dr. John Townsend (Psy.D., Rosemead Graduate School of Psychology) is a psychologist, popular speaker, radio host and the bestselling author and co-author of numerous books, including the Gold Medallion award-winning Boundaries and God Will Make a Way. He is co-founder of the Cloud-Townsend Clinic in Southern California. Customer Reviews For "God Will Make a Way"